This month, one of my favorite mystery writers, Elizabeth Spann Craig, shared her checklist of things to do when she publishes a book: Release Activities for the Reluctant Promoter. I was SO happy to read Elizabeth's post; I did the Scooby dance. I love checklists, I'm always forgetting something, and it never occurred to me to print out a publishing checklist and tack it to the back of my office door. So, without further ado, here's Elizabeth's checklist for self published books. By the way, for your traditionally published authors, do head over to Elizabeth's blog, she has a checklist for you as well. 1. Upload your book to the online retail stores of your choice. For me, that means: Smashwords, Kobo and Kindle. Elizabeth Craig puts her book in Nook as well, but I let Smashwords take care of that for me. 2. Create a POD version of your book. Two great services for this are CreateSpace and Lightning Source. 3. I check Smashwords to make sure there were no issues with the upload and the meatgrinder didn't choke on my manuscript. I keep checking back until I see my book made it into their Premium Catalog. 4. Elizabeth Craig creates an audiobook version using Audiobook Creation Exchange (ACX). Put a thumbnail of your cover up and link it to a book page on your website with a larger image and an excerpt from the book as well as links to everywhere folks can purchase a copy. If you get a great review, don't be shy about putting that up as well! 2. Update your social networks. - Blog about your new release. This is one of the main reasons authors need to have blogs! It's a great way to let your readers know you've written another book. - Tweet about it. Tweet your blog post and let all your Twitter followers know you've released a wonderful new book. - Facebook. Elizabeth Craig posts a publication announcement on Facebook. 3. Amazon Author page. Don't forget to add your new publication to your list of books. 5. LinkedIn. I don't use linked in, but if you do it's a good idea to update it. 6. Update bios. I haven't done this lately and probably should. Remember to keep your bios up to date, including the photo! 7. Tell your newsletter subscribers about your new book. Perhaps tell them a bit beforehand and offer them a promo code to either get free copies, sale copies or something cool like a mug or t-shirt. 1. Goodreads Giveaway. Elizabeth Craig writes, "Once I’ve got CreateSpace live, [I] order copies for a Goodreads giveaway." This probably deserves another blog post and, of course, a link on your website. 2. I've mentioned this, above, but you could let your newsletter subscribers know in advance about your book coming out and perhaps have some sort of a giveaway. 3. Many authors find blog tours productive. If you don't have time for a blog tour, you can always write a few guest posts. 4. Some authors use Amazon's Select program to promote their books. I've written about that here and here. As Elizabeth Craig says, the number one thing you need to do when releasing a book is keep writing! Best of luck, may all your book releases be smooth. Cheers! 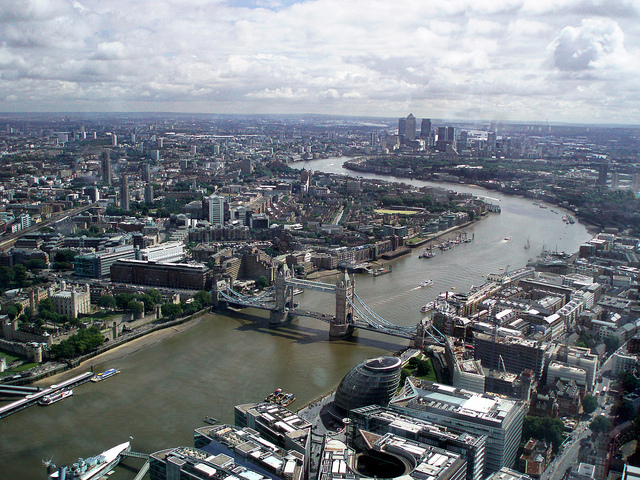 Photo credit: "London: Tower bridge and the Thames" by Caroline under Creative Commons Attribution 2.0. Nice succinct list! Looking forward to using it as a template.